Ninja Golf. Phalanx. Wall Street Kid. David Jaffe. If any of these names ring a bell with you or your friends, you may have a great Halloween costume idea ripe for the taking right here. As is annual tradition, the retro costumesmiths at Vintage Computing and Gaming have put together a can't lose list of video game themed costumes that range from simple (David Jaffe, Minecraftsman) to nigh impossible (Doom Cacodemon, Ken Levine). We promise that if you follow Benj Edwards' advice, you'll be the only Kickle Cubicle at whatever Halloween party you crash this weekend. If you claim ownership of a banjo and overalls, you're halfway to a Phalanx "Banjo Hillbilly" costume! Make sure to pay close attention to VG&C's "In-Character Behavior" recommendations, like this one for the deceptively simple David Jaffe of Twisted Metal costume: "Openly proclaim, 'I'm not eating candy again, EVER.' Then immediately pull out a Snickers bar and chomp into it. When people complain, threaten to stop talking to them for a year." 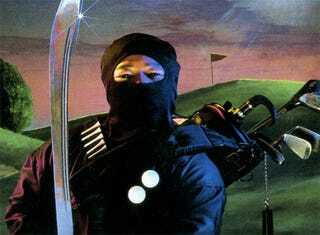 But seriously, nobody go as the Ninja Golf ninja. I've already called dibs.